Thank you for sharing these adorable and even some unique Christmas decorations. You've put me in the mood to start pulling out some of mine! I have couple of stuffed snowman and they're among my very favorites, they just look so happy and jolly sitting around! Hugs! Love the photo of your son and kitty under the tree-precious! Very nice decorations- a childhood memory treasure. I love you international nativity sets. My cat was sleeping under our tree, but jumped up to sniff the camera when I tried to take a picture. Your decorations are precious! My favorite decorations aren't actually up yet, although we did do the tree this weekend. We have a shelf across the length of our room and my Precious Redhead insists on putting on it's Christmas suit ever year with lights and the many Christmas standables we've collected. LOVE these decorations! 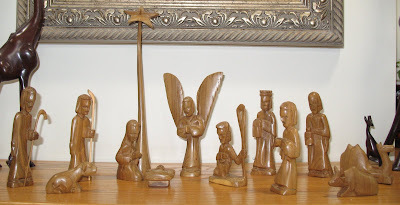 We just do the tree - used to do a nativity, but it was a BIG one (not much room) and most of the pieces are broken. REALLY should buy a new one.